The rise of experiential learning has challenged traditional delivery models and led to an increase in the application of gaming to promote learning in higher education. As such, computer-based games are being used more and more to motivate students, encourage engagement, and ultimately improve learning outcomes. Games, overall, are well aligned with a constructivist model of learning in which students become active participants in the learning process through exploration. The education environment through social media gaming, in particular, changes from passive to active as learning activities require active engagement and tend to leverage one's personal experiences. This case study illustrates the benefits students in a blended learning course derive from using a game designed on the SCVNGR platform for smartphones. Feedback from students indicates increased collaborative learning and teamwork. The case study further elaborates on the broader advantages, challenges, and opportunities of using various digital games for learning and teaching in higher education. In the past several years, there has been a significant increase in online learning in higher education due to the proliferation of information and communication technologies (ICTs) (Precel, Eshet-Alkalai, & Alberton, 2009; Stephenson, 2001). Blended learning is a particular model of ICT-supported education that integrates face-to-face, classroom-based experiences with online learning experiences delivered via the Internet. There is evidence that the blended learning model can be more effective and efficient than the traditional face-to-face delivery model (Twigg, 2003). Efficiency gains arise from students not having to be in the same place at the same time to discuss learning topics, while effectiveness is achieved through the support of collaborative learning environments that foster communities of inquiry and discourse (Garrison & Kanuka, 2004). Sharples (2000) posits that learning has increasingly become more individualized and learner centered, and that new technologies, thanks to their portability, enable people to learn continuously, irrespective of their location. However, significant challenges remain with blended learning. One of the main hurdles is to adapt the educational experience to align with this new model. According to Garrison and Kanuka (2004), "Blended learning inherently is about rethinking and redesigning the teaching and learning relationship" (p. 99). Online learning materials and technologies should not be simple "add ons" to the traditional face-to-face delivery experience, but rather there should be thoughtful integration between the two delivery mediums. Other challenges associated with blended learning include those that have to do with financial, human, and technical resources needed to support the model (Garrison & Kanuka, 2004; Shemla & Nachmias, 2006); the need to provide training and support for both instructors and students with regard to the use of technology for learning and teaching (Garrison & Kanuka, 2004); the dominance of online discussion by individuals or groups (Murphy & Coleman, 2004); and the feelings of loneliness, exclusion, and frustration experienced by students when studying online (Bates & Khasawneh, 2007; Murphy & Coleman, 2004). The rise in experiential learning has challenged traditional delivery models and led to an increase in the application of gaming to promote learning and engagement in higher education. This case study reports on the educational experience arising from the use of a low-cost mobile social media game in an undergraduate blended learning course. The main objective of the game was to integrate online and face-to-face aspects of the course in hope of achieving enhanced learning outcomes. The instructors also aimed to encourage teamwork and an overall enjoyable student experience through various design elements of the game. Following a description of the case in this paper, an evaluation of the impact on students, instructors, and the learning process is presented, along with a general discussion of the implications for using digital games in higher education more broadly. Computer-based games are being used in higher education to motivate students, raise engagement among learners when discussing course concepts, and ultimately improve learning outcomes (Chaudhary, 2008; Gros, 2007). These games can take many forms, including multiplayer and single-player video games, virtual worlds such as Second Life, online simulations, and social media applications including location-based services like Foursquare and SCVNGR (Klopfer, Osterweil, Groff, & Hass, 2009). While computer games have been used for the past several decades in corporate, military, and healthcare training settings, there has been a recent surge in computer game use in higher education (Jong, Shang, Lee, & Lee, 2008). There are several reasons for this. Young adults have become familiar with video games and social media in their personal lives, and this familiarity makes it easier to experiment with these technologies in the classroom (Klopfer et al., 2009). Social media technologies (e.g., blogs, wikis) and tools/platforms (e.g., Twitter) have increasingly been used in universities and colleges in the last five years to enhance learning and engagement (Alexander, 2006; Junco, Heiberger, & Loken, 2010; Parise & Guinan, 2011; Rodriguez, 2011), thus providing a conducive setting to experiment with social media-based games. Another driver of digital games in the classroom is the relatively low cost of creating, acquiring, and implementing many social media-based gaming platforms, especially when compared to traditional licensed gaming simulations. Finally, there have been dramatic improvements in the technology itself that result in more realistic and effective gaming environments. Computer games lend themselves to active learning mainly due to their design elements. Such games often include one or more of the following characteristics: (1) a goal or "win" condition that players strive to reach; (2) rules and outcomes that must be followed; (3) obstacles or challenges that need to be overcome; (4) an environment that can be explored and in which one must be creative to succeed; (5) a competitive element where goals act as catalysts for action; and (5) interaction with others (Jong et al., 2008; Lepper & Cordova, 1992; Prensky, 2001). Effective games also contain features such as points awarded for attaining certain statuses or clearning specific hurdles; leaderboards so players can monitor their performance relative to others, thus spurring competition; and "badges" that convey status, expertise area, reputation, or group identification. An example of the leveraging of game elements, or "gamification," in education can be seen in OpenStudy, a website on which students ask and answer questions in a study group format. They receive medals as rewards for answering questions, and earn badges for participation and levels of achievement (e.g., "superstar") as they progress and help one another. The Massachusetts Institute of Technology has recently used OpenStudy to promote collaboration among its OpenCourseWare users (Sprague, 2011). Recently, research on the pedagogical value of computer-based gaming has begun to proliferate, with specific attention being paid to game design features and the influence of games on learning styles (Gros, 2007). Computer games are well aligned with a constructivist model of learning, in which students become active learners through exploration and problem-solving activities (Dickey, 2005; Gee, 2003; Gros, 2007). Rather than knowledge being transmitted by instructors to students in a didactic manner through a lecture format, the constructivist view holds that knowledge is constructed by individual learners through engagement in social and collaborative processes (Jonassen, 1999; Vygotsky, 1978). As highlighted by DeKanter (2005), when paired with the appropriate content, computer games can offer a three-dimensional learning construct, with teachers talking to students, students challenging one another, and an entire class discussing the causes and effects of a game scenario. Games provide a platform for continuous learning by encouraging students to explore course concepts and learn through trial and error (Thomas & Brown, 2011). Gee argues that computer games reflect the experiential learning cycle (Kolb, 1984), wherein students examine and act in/on the virtual environment, reflect on their findings, and then further investigate the environment. Often, the learning cycle cultivates enhanced decision-making skills as students have to make judgments in complex situations. These environments also teach students to be creative as game goals may require them to create content, characters, or solutions (Royle, 2008). The implementation of gaming technologies in educational settings has produced evidence of improvement in analytical skills among various groups of learners (Schmidt & Vandewater, 2008). In addition, digital games can enhance a learner's overall critical-thinking ability in the classroom, and when used effectively, engage students in active problem solving (Green & McNeese, 2007; Salomon, 2002). These games promote dynamic cognitive activity as the learner faces challenges and must draw upon his/her critical-thinking and problem-solving skills to overcome those challenges (Dawes & Dumbleton, 2001). This active process results in the development of higher order metacognitive and justification competencies (Henderson, 2002). For example, Virtual U is an online game that applies a traditional gaming framework to enable a greater understanding of management practices in American colleges and universities. Players step into the decision-making shoes of a university president and assume responsibility for establishing and monitoring all the major components of the institution (Charsky, 2010; Virtual U, 2003). They gather information needed to make strategic decisions and to understand the implications of actions like decreasing faculty teaching time or increasing athletic scholarships. Much of the potential of computer games for learning lies in the fact that a well-designed game can lead to higher student motivation to solve problems and to learn (Dondlinger, 2007; Royle, 2008). Research has shown that constructs such as fun and enjoyment are important in the learning process (e.g., Bisson & Lunckner, 1996). Thomas and Brown (2011) argue that multiplayer computer games spark curiosity, imagination, and a sense of play that are integral to learning, but that are missing from the traditional "textbook-and-test" classroom. Computer games can facilitate an environment in which students are able to have fun and at the same time are challenged and rewarded (Prensky, 2001). The motivation and the activities inspired by playing games can give rise to an engaging and participatory classroom culture, which forms fertile grounds for learning (Barab, Thomas, Dodge, Carteaux, & Tuzun, 2005). Many instructors introducing games as a supplement to their traditional lectures as have witnessed gains in student interest, motivation, and retention (Baid & Lambert, 2010; Kritz & Hense, 2006). Moreover, multiplayer computer games foster teamwork and collaboration. Such games often require players to work in teams to solve challenges under time constraints and pressure (Chaudhary, 2008). According to Prensky (2001), the "gamer generation" prefers interacting (collaborating or competing) with others over playing alone with the computer. Working in teams within social game environments also reflects the increasing emphasis on virtual work structures in higher education and in organizations. ICT tools equip educators with a wide range of options for planning interactive activities to make learning engaging. The efficacy of the tools, however, is very much dependent on the pedagogical strategies adopted (Ferdig, 2006). When thinking about implementing digital game technology, faculty should carefully weigh the desired learning outcomes, the classroom environment, and the specific needs of the students (Amory, Naicker, Vincent, & Adams, 1999; de Freitas & Oliver, 2005). It is also necessary for the instructor to possess a basic understanding of the functioning of the technology so as to be able to envision the possible gaming experience students will undergo (Egenfeldt-Nielsen, 2004). Instructors must provide support and scaffolding to learners during and within the actual game as well as outside of the game, for example, thorough class debriefs, to further solidify learning (Klawe & Phillips, 1995). While the educational benefits of computer games are many, there are some potential challenges that need to be recognized. Students may not be immediately motivated to use games for learning, even if they use games recreationally (Whitton, 2007). Some computer games are difficult to master, which may put certain individuals at a disadvantage (Chaudhary, 2008). There is also the challenge of maximizing transfer of learning from the gaming environment to the real world (Gros, 2007). Then there is the "pointsification" syndrome, a condition in which students are more interested in winning than in learning. Finally, mobile technology is playing an increasingly key role with respect to digital games and student learning. For example, Schwabe and Göth's (2005) mobile game experiment highlights how newcomers to their University found the competitive nature of the orientation activity the authors designed for the students to play via their mobile devices both fun and helpful in getting to know places, events, and people on campus. However, there is still a lack of both a common understanding of mobile learning and a consensus around its terms and definitions (Frohberg, Göth, & Schwabe 2009). Frohberg et al. analyzed mobile learning projects using the following criteria: tool (e.g., mobile technology), subject (e.g., student learner), object (e.g., knowledge and skills), control (e.g., social rules), context (physical place), and communication (e.g., learner interaction). They found a number of gaps in the extant research, pointing out that communication and collaboration tended to play only a minor role in the mobile learning projects they reviewed, and that most of the projects were targeted at novices, not advanced learners. Presented hereafter is a case study that gives an account of the authors' experience with developing and implementing a mobile-based academic game for college students. The objective of the case study is to make a meaningful contribution to the existing literature on both game-based and mobile learning by illustrating how a low-cost mobile game can be used to support students' learning in a blended-delivery course. In particular, the game was intended to achieve both "hard" learning goals, such as reinforcing course content through its application, as well as "soft" learning goals, such as building group cohesiveness. The instructors also designed the game with a view to studying the impacts of motivational aspects, especially competition, on student engagement and game behavior. The context for the case study is an undergraduate social media course that was taught by the authors in the Fall of 2011 at Babson College in Wellesley, Massachusetts, USA. Twenty-four students comprised of 10 sophomores, eight juniors, and six seniors, all majoring in business administration and interested in information technology, were enrolled in the course. The primary objective of the course was to encourage students to reflect on the strategic importance of social technologies in today's knowledge economy. The classes focused on how social technologies can help businesses capture and leverage the underlying connections among employees, consumers, and business partners. Teaching materials included recent cases of companies using the latest social technologies in various aspects of the business, including marketing, customer service, research and development, innovation, and human resource development. The students also experimented firsthand with social media and various innovative technologies and platforms. They all, for instance, created individual Twitter accounts and used a class hashtag on a regular basis to communicate with one another and to share information, including links to articles and videos relevant to the course content. The course was delivered in a blended format, with five 3.5-hour face-to-face weekly sessions mixed with three weeks in which the activities were done online. During the first online week, students were asked to interact asynchronously in a case discussion through a discussion board within the College's Blackboard learning management system. During the second online week, the class experimented with SCVNGR, a social media gaming platform with an easy-to-use interface that aims to let anyone, even those with limited technical skills, develop, manage, and deploy their own interactive mobile game. The SCVNGR platform is currently being used by over 1,000 businesses and educational institutions, and organizations can test the software for free to see if it meets their needs (SCVNGR, 2012). SCVNGR was selected as the platform of choice as the College had already engaged in a contract with the provider and had previously experimented with the platform during non-academic events such as Orientation and Homecoming. As a result of the existing license agreement, the exercise did not entail any costs. The two instructors designed a scavenger-hunt game that the students played via the SCVNGR platform over the course of five days (Monday through Friday) in the second online week of the course. The instructors had no prior experience using the platform, but they learned how to use the software with little effort by both reading available instructional documentation and meeting with a college administrator who had used the game as part of incoming class orientations. Five student teams, each made up of either four or five members, took part in the game. The game required at least one student per team to use either an Apple iOS- (i.e., iPhone) or an Android-based smartphone. Each team had to download the platform on their mobile device and create an account in order to access the game. This did not pose a barrier for the students as approximately two thirds possessed a smartphone. The game comprised 11 challenges, many of which had multiple parts (and points) associated with them. Each challenge included a "location" component in which teams had to physically visit a specific location, either on the College's campus or relatively close to the campus, and complete a task successfully to earn points. 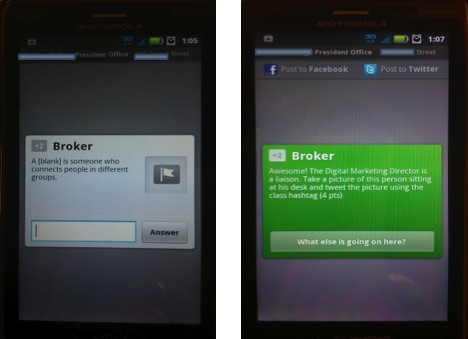 Challenge answers were entered directly by a single team member into the SCVNGR platform or submitted through another channel in accordance with instructions (e.g., "tweet the image to our class hashtag"). In each case, the team had to answer the first part of the challenge in order to receive instructions for the second part. The instructions for the second part (where applicable) were delivered through the SCVNGR platform. Figure 1 contains screenshots of the first and second parts of a challenge. 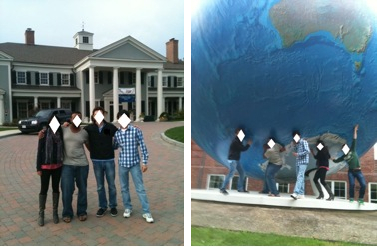 In this example, students had to go to the President's Office building to complete the first part of the challenge. Entering the correct answer – "Liaison" – would reveal the second part of the challenge. See Table 1 for a complete listing of the actual challenges and the respective points they carried. A ... is someone who connects people within their group. What does POST stand for? Please take a photo of three members of your team in front of a goal post at the College's hockey ring wearing College's apparel. Nice job! Now send a private tweet to @[username] that contains both the picture and the answer to the question (spell out the acronym). A ... is someone who connects people in different groups. Awesome! For an additional 4 points, the digital marketing director is the liaison between the College and SCVNGR. Go to his/her office, take a picture of this person sitting at his/her desk and tweet the picture with the class hashtag. What company did Brian Finkelstein have trouble with, and via what social media outlet did he use? Great job getting the details from the readings ... What would you do if you were Comcast? For an additional 4 points, e-mail me a short action plan that explains how you would handle this situation. How did Jonathan Stark draw traffic to his new website (3 points)? Check in at one of these stores and create a QR code that may help drive business to the store. Tweet the QR code (picture) to our class hashtag (4 points). 3 C's: What do the 3 C's stand for? Nice! Please go as a team to the landmark on campus that best exemplifies the second "C" (hint: "global"). Take a picture of three other community members and your entire team in front of this landmark and post your picture on the College's fan page on Facebook. You will get two additional points if you do so! ... is the network metric for the average distance for people to get to all other people. You got it! Now take a picture in front of [name] Hall of your entire group modeling "cohesion" – get creative! Tweet the picture using both our class hashtag and the College's hashtag. Scan an existing QR code on the College's campus. You can find the QR code on campus (e.g., store, flyer, TV advertisement). Download and tweet the image to our class hashtag. One of the most famous golf courses in the country is located in the Boston Area. What year was the Ryder Cup held there? Nice! And now please tweet the link of the YouTube video of the winning put using our class hashtag. Finally, take a photo of your team in front of the Country Club and email it to me directly. 5 points will be awarded to you once all of these tasks have been completed! ... is the network metric that shows which individuals are "well-connected" in the network and which are on the periphery of the network. Well done! As a group please go to [location]. Take a short video of your team that recaps your Scavenger experience so far and upload it on YouTube. Also, tweet the link of your video using our class hashtag. The challenges were designed by the instructors with deliberate pedagogical intent: they were designed to reinforce classroom content, encourage experimentation with new technologies and social media, foster team cohesiveness, and supply relevant context to allow students to apply the social technology in real-life business situations. With regard to reinforcing classroom content, the first part of many of the challenges involved very specific knowledge objectives that had been covered in earlier classes, such as explaining what the POST method is (Challenge 3). There was also an emphasis on applying the challenge activity to a functional business area, such as marketing or public relations. In addition to playing the smartphone game itself, student teams obtained hands-on experience with social technologies through tasks such as filming videos and posting them on YouTube and creating Quick Response (QR) codes for an existing website (by using a free web-based QR code generator that the students had to locate on their own). Finally, all of the challenges involved some degree of team coordination, from organizing member activities to carry out research to solve the challenge to capturing team pictures and videos and presenting them on a Facebook site or YouTube channel. See Figures 2 and 3 for some actual student-generated artifacts that were outputs from the challenges. For example, one of the challenges (Challenge 6) required that students go to a local Starbucks outlet, after answering an initial question regarding Starbucks on the gaming platform. The second part of the challenge was to create a QR code for the store they visited. A QR code is essentially a barcode that can be read by a smartphone's camera to deliver a website uniform resource locator (URL), contact information, short text messages, and/or links to other information. Therefore, the teams had to first download QR software (often free or preinstalled) to their smartphones to read and create QR codes. They then had to design a QR code for the relevant store. The QR designs created by the teams included items such as: the URL of the store's website; store contact information including address, phone number, and hours; a list of store products and prices; and a mockup of store coupons and discounts. This challenge emphasized the application of mobile computing to marketing, a concept that had been introduced in the face-to-face classes. The challenge also called for students to experiment with a new social technology, in this case QR code software for smartphones. Finally, team coordination was required to develop the QR code design. Teams received three points for successfully completing the first part of the challenge, and up to four points for successfully completing the second part. Directions were provided to the class a few days prior to the actual commencement of the game. Students were told the game would be played in teams – the same teams they had pre-selected earlier in the course. The directions also included: that the game would be played on the SCVNGR mobile platform and that they needed to download the software and create an account in preparation; that the game would consist of several challenges, some having multiple parts; that each challenge would have points associated with it, and the team with the highest cumulative point total at the end of the week would win the game; and finally, that the instructors would post online all teams' cumulative scores at the end of each day. The instructors had some discretion as to challenge points awarded based on how effective they judged the team's solution to be. This was typically the case for challenge parts that were more open ended and did not have a single correct response (often the second part of a challenge). There were 62 points available in total across the 11 challenges. The instructors also announced there would be bonus points available to: the first team who tweeted that the SCVNGR game was available (two bonus points); the first team to complete three full challenges (three bonus points); and the first team who had completed six challenges by noon on Wednesday (five bonus points). Therefore, the highest point total any team could achieve was 72 points. Instructions also stipulated any team failing to start the game by 8:00 a.m. on Thursday would lose three points. Of course, all teams were expected to actively participate in the game as this counted for class participation, which contributed to a significant portion of a student's grade for the course. In addition, the winning team would win a "prize," but the instructors did not indicate what that prize would be. After Team 2 had established a large lead by mid-week, the instructors notified everyone that there would be a second-place prize. The instructors added the prizes (modest gift certificates) as extra incentives, in line with the game experience. A 60-minute optional student focus group was conducted by the instructors at the end of the course to obtain students' feedback around the use of SCVNGR as a social media gaming platform and learning tool in the course. See Table 2 for the list questions used. Interviews were also conducted with students who could not attend the focus group. The two instructors also provided their feedback. A total of 17 students (of the 24 students in the course) participated in the focus group and interviews, including at least one member from each team. Do you feel that your overall learning was enhanced by the use of the SCVNGR gaming platform. If so, in what ways? What did you find most interesting about the game experience? Most fun? Can you tell us about your group dynamics? Describe the coordination process to complete the challenges. Did your team plan a strategy before starting the challenges, or did a strategy emerge as you were playing the game? What role did competition play in your participation? How did the daily score report motivate you – if at all? Did the idea of a final prize motivate you? If so, how? What functionality/technology features of the gaming platform did you like or find interesting? Find frustrating? What were the biggest challenges you encountered in the process of playing the game? Do you think that this platform should be used in other courses? If so, what would be your recommendations? 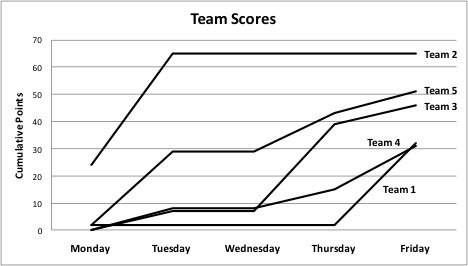 Figure 4 charts the day-to-day cumulative scores for each team, with Team 2 winning the game, having scored a total of 65 points. Team 5 finished in second place with a total score of 51 points. All teams received at least half the total available points. Six general findings emerged from the debrief and feedback, which are discussed in turn below. 1) The mobile social media game enhanced students' overall learning experience, mainly through hands-on experimentation and application of course content. Essentially all of the students indicated that participation in the game resulted in very positive learning outcomes for them. All challenges were designed so that the students had to demonstrate their knowledge of course content as well as experiment with and apply social media to business situations. As one student remarked, "Our team feels as though we learned a lot. In my opinion, playing SCVNGR was very engaging and interactive. We had to review our class notes, as well as doing some additional research to complete the challenges." Also, students repeatedly mentioned the experimentation aspect of the game experience as critical to their learning. For example, for many of the students, this was the first time they had created videos and posted them to YouTube, or taken pictures and tweeted them. Students derived a great deal of satisfaction from completing these tasks, especially after realizing the tasks were not as difficult or overwhelming as they had initially thought. Other students mentioned that what was critical was relating or linking challenges to the course concepts in some way. The game did not feel "artificial" or forced, but real and relevant, according to one student. Several students cited the Starbucks challenge as an ideal way to understand the importance of mobile applications to branding and customer communications. As one student put it, "It's one thing to discuss case examples of retailers using Foursquare and other mobile apps, but to actually design something brings a whole new level of learning." Also, the last challenge required teams to create a video that summarized their game experience and post it to YouTube. This caused students to reflect holistically on their learning from the weeklong game. 2) The game was fun and enjoyable for students. Students described the five-day game experience as "fun," "exciting," and "having a great time." In the words of one student, "Our team had to meet at the library to complete one of the challenges. Other people noticed what we were doing and asked what the project was about. When we told them about the game, they were very jealous since they saw how cool it was." The students observed that this online week differed greatly from a traditional week of asynchronous online activities (involving a Blackboard discussion board) in that it engendered a much greater level of engagement. For many students, they saw the online discussion boards as an extension of in-class discussion and as "just another assignment" they needed to complete amid their busy schedules. The game, in contrast, was very new to them, so the novelty of the experience itself helped motivate them to do their best since it incited a high level of enthusiasm and excitement. Students mentioned both the tactile/location-based and competitive components of the game as factors contributing to making the experience an enjoyable one. 3) Playing in teams early in the semester fostered group cohesiveness and paved the way for collaborative learning throughout the remainder of the semester. By playing the game, students spent numerous hours working with one another outside of the classroom in a non-traditional context. The following quote exemplifies their general feedback on the group dynamics facilitated by the game: "Thanks to this session I met new people and made new friends. Playing a game is not something I had ever associated before to [sic] an academic environment. It made a big difference for our team. After the SCVNGR week I felt as though everyone was much more comfortable communicating with each other." The scavenger hunt helped strengthen team cohesiveness and it enhanced communication and information sharing among the students. None of the teams had ever experimented with SCVNGR prior to the course, and many of the students were not familiar with some of the technologies used in the challenges. By working together, however, they managed to successfully complete the work that was required. Also, as there were often multiple tasks to complete for a given challenge, the coordination aspect of getting all of the tasks done in a timely manner further enhanced team building. Finally, the act of taking pictures and shooting videos as a team, as well as competing against other teams, helped build team unity and pride. The SCVNGR hunt ultimately set a positive tone for the rest of the semester and laid the groundwork for the ongoing development of fruitful and productive working relationships. 4) The competitive nature of the game motivated the students to actively participate and acted as a powerful performance incentive. At the outset, the instructors explained that there would be a prize for the team ending the week with the highest score. Most students commented that the competitive nature of the game served as a positive motivator, and knowing that the instructors would recognize the winning team with a prize further spurred energy and action. Furthermore, the daily reporting of team scores proved effective as it provided transparency and allowed each team to gauge its relative standing. As the week progressed, and to further stimulate participation, the instructors made the decision to offer a second-place prize. According to one student, "The daily score releases were of great help. When we saw by how much Team 2 [the leading team] was ahead we were discouraged. At that point, finding out about a second prize really motivated us." Modest gift certificates were given as prizes to the winning teams, but it was peer and instructor recognition of being the most successful team (versus a tangible prize) that seemed to drive teams to excel from the competitive aspect of the game. 5) The biggest obstacles in the game had to do with team coordination. By far the most difficult part of the game experience identified by all teams was coordination among team members. While all students knew beforehand the game would be played in teams, they did not realize the extent of scheduling, communication, and collaboration that the challenges demanded until they started playing the game. For example, for many of the challenges, all team members had to gather simultaneously to create videos and take photos. One member from Team 1 e-mailed the instructors stating that the team would probably not be able to actively participate in the game until Thursday because of conflicts between team members' individual schedules. The team still managed to finish strongly and felt they learned much from the challenges they did complete. Students learned quickly that the game necessitated significant, if not greater, group coordination in comparison to a standard group assignment. Several students remarked that they had to be together to complete the challenges and collaborate synchronously as opposed to being able to simply divide the work up into portions for each member to undertake separately. Finally, some teams, such as Team 2, explicitly devised a game strategy aimed at maximizing their total point score. Team 2 specifically wanted to capture the bonus points, so they coordinated their schedules to complete most of the challenges early in the week. It is noteworthy that a few teams did not attempt the challenges in order, instead choosing to schedule the challenges taking into consideration the task and place. 6) The instructors felt the game was an effective way to reinforce the course learning objectives. Both instructors were very satisfied with the game experience. From a pedagogical standpoint, they found the game effective in reinforcing course concepts through an entertaining and engaging experience. One of the instructors reflected that he had mostly used online discussion boards in blended learning courses he had taught in the past. Retrospectively, in comparison, the game did a few things to improve the learning experience. Firstly, it provided variety so that students did not become tired of engaging in text-based asynchronous discussion every online week. Secondly, there was a very high degree of active learning that took place with the game. Finally, the game experience supplied a reference point that could be used in the rest of the course. For example, some of the social media marketing concepts were not discussed until later in the semester after the SCVNGR game week. Yet, the Starbucks challenge involving QR codes was brought up in subsequent class discussions and team projects involving those concepts as students were now able to place the concepts in context based on the firsthand experience they gained while playing the game. The use of digital games holds much promise in higher education as a means to deliver effective online learning that is active, playful, and engaging. In the present case study, both students and instructors found the game to be an effective way of contextualizing and reinforcing course topics and encouraging experimentation with new technologies. Another beneficial outcome arising from the game experience was that it helped build student team rapport and cohesion, which was particularly valuable since the game was played early in the semester, and there were many team activities and deliverables later on in the course. Also, the competitive nature of the game is believed to have had a positive effect on engagement. To avoid a potential so-called "pointsification" problem, instructors should carefully think through how to allocate points. In this case, the instructors gave more points for more effective challenge solutions. Importantly, the game rollout occurred with very little training overhead or "costs." While the course in the present case was a business course on the value of social media in organizations, this type of mobile social media game could also be used in courses across different disciplines. An important design criterion should be to choose places that are relevant to the course. For example, in a finance course the places might be banks and ATMs, in a marketing course they might be retailers, and in a liberal arts course historical landmarks and libraries might be chosen. Next, the instructors should carefully construct challenges that meet their learning objectives for the course. The playful and competitive aspects of the game should translate well to other disciplines. The authors further believe that the approach and findings have relevance and utility beyond the higher education sector, for example, in corporate settings, in areas such as training and new employee onboarding. Digital mobile games potentially can enhance both "hard" (e.g., technical or job-specific skills) and "soft" (e.g., teamwork) employee learning by adding complementary motivational factors (e.g., fun, competition) to those found in formal training methods. This particular game could alternatively be played by individuals or pairs of students. This would alleviate the coordination challenge that occurs with larger teams. If the instructor had a substantial, contiguous block of time at his/her disposal, such as a three-hour time slot, then the game could also be played synchronously. In any case, instructors need to be careful when estimating how long challenges will take to complete so that the allotted time to play the game matches what is realistically needed to complete game tasks. For example, in this case study, not every team was able to attempt all 11 challenges in the time available. Finally, with any digital game, it is crucial to be wary of the learning curve faced by students in using the technology, and to take appropriate steps to reduce technical barriers. To this end, a great amount of thought and care was put into the instructions for the SCVNGR game. The last thing the instructor wants is for confusion and/or frustration to arise around how to operate the technology or platform, and to be bombarded with a large number of questions in this regard. This might create an initial negative impression, thus detracting from the learning objectives of the game as well as from the overall fun of the experience. Though as a whole promising, the exploratory findings of this case study are limited to a one-week game exercise involving a group of 24 undergraduate students. In order to further substantiate and make possible the generalization of some the findings, it would be necessary to replicate the study with different audiences (e.g., graduate students) and also modify game content and tasks for trialing with different disciplines. Also, because the case study was neither designed as a traditional experiment nor as a quasi-experiment, it is difficult to identify a distinct learning baseline beyond students' feedback (including their self-reported learning outcomes) and the content of the course's Twitter feed. The evaluation also relied, to an extent, on the instructors' observations. Some comfort may be found in the fact that the students consistently expressed that they felt as though they were learning more than what they would during a traditional online week or a face-to-face lecture, and that they had substantially more fun. Future research might investigate more precisely the extent to which specific learning objectives are achieved through mobile social media games such as the one described here within a blended learning context, when compared to other learning strategies and delivery modes/methods. The case study reported in this paper has focused on a rapidly emerging learning model and practice – the use of computer games and gamification of learning processes – which can positively impact both students and instructors. Social gaming dynamics can increase students' motivation and desire to learn, help them develop stronger relationships with their team members and classmates, and ultimately aid them in the knowledge-discovery process. This case study has identified some specific design characteristics in an attempt to help illuminate and explain the learning benefits as well as to inform the future development of games that leverage emerging social media platforms and mobile technologies. Educational game designers, overall, should strive to combine traditional gaming frameworks with clear pedagogical elements to assist students in achieving their full learning potential. To conclude, as the trend toward more blended and online delivery in higher education seems unabated, the use of social media games can potentially serve as an effective vehicle for mobile and contextual learning that complements existing ICT tools like online discussion boards and lecture podcasts. Going forward, this is an important area of research and development that warrants further attention by the academic community. Bisson, C., & Lunckner, J. (1996). Fun in learning: The pedagogical role of fun in adventure education. Journal of Experiential Education, 9(2), 109-110. Chaudhary, A. G. (2008). Digital game-based learning – future of education? Pranjana: The Journal of Management Awareness, 11(2), 1-15. Gros, B. (2007). Digital games in education: The design of games-based learning environments. Journal of Research on Technology in Education, 40(1), 23-38. Retrieved from ERIC database. (EJ826060). Jonassen, D. H. (1999). Designing constructivist learning environments. In C. M. Reigeluth (Ed. ), Instructional design theories and models: A new paradigm of instructional theory (Vol. 2, pp. 215-239). Mahwah, NJ: Erlbaum. Parise, S., & Guinan, P. J. (2011). Whom do I know? Building and engaging social networks using social media technology. In D. Greenberg, K. McKone-Sweet, & H. J. Wilson (Eds. ), The new entrepreneurial leader: Developing leaders who will shape social and economic opportunity (pp. 202-216), San Francisco, CA: Berrett-Koehler. Prensky, M. (2001). Digital game-based learning, New York, NY: McGraw-Hill. Salomon, G. (2002). Technology and pedagogy: Why don't we see the promised revolution? Educational Technology, 42(2), 71-75. Stephenson, J. (Ed.). (2001). Teaching and learning online: Pedagogies for new technologies. London, UK: Routledge. Thomas, D., & Brown, J. S. (2011). A new culture of learning: Cultivating the imagination for a world of constant change. North Charleston, SC: CreateSpace.